Reflection from Ursula Endlicher Eyebeam Alum who was in residence from 2017. She talks about her time as a resident and her project FAR-FLUNG. Ursula Endlicher turns code into material form. She builds frameworks for Internet Art works and performances, but lets real-time data be the lead for their choreographies. She extracts rule sets from the Web and repurposes them for installations. She has exhibited and performed her work internationally in venues such as transmediale Berlin; SIGGRAPH Asia; ZERO1 Biennial; at the Center for Performance Research, NY and on Turbulence.org. She recently finished her project residency at Eyebeam, NY. Her work is part of the permanent collection of the Whitney Museum of American Art. I am thrilled being given the opportunity to work on the further development of my project series FAR-FLUNG, which questions the physical and metaphorical interfaces between computers and humans. For me, Eyebeam represents a place that always asks for the most pioneering ideas of how art and technology intersect, a mindset that supports critical curiosity, and a community that encourages openness and collaboration of all kinds, especially important at this moment in time. It is through this community – the Eyebeam alums – that I recently got nominated for a Project Residency, which I will be starting in January 2017. At Eyebeam I will start developing the third and last round of the FAR-FLUNG project, a series of large-scale performances driven by real-time data, that will consist of public research scenarios, performative events, development workshops, objects and installations. I create networked performance scenarios for spaces and people. Environmental and logistical data from a variety of locations and sources are constantly and in real-time changing the infrastructure of the performance space and are choreographing the actions of the performers and the audience, who’s every move is tracked and documented, but who can also feed back into the system. Can protocols and mechanism that are inherent to computers give back to the human who created it, and teach us something about the human condition? Can the grammar and logic that governs our globally networked systems be utilized physically and in performance? The Internet of Things allows us to learn about how computers actually experience our world; it makes the logic of the digital physical. Different network protocols – such as http, ftp or p2p – can trigger different story layers. Data infiltrates our every move and choices. FAR-FLUNG explores our notions of networked connectivity, questions of public and private, and seeks to make these hidden processes visible and experiential. What if human performers are to solely follow algorithmic decision-making? What if performances don’t end in synthesis, only in continual reboots? 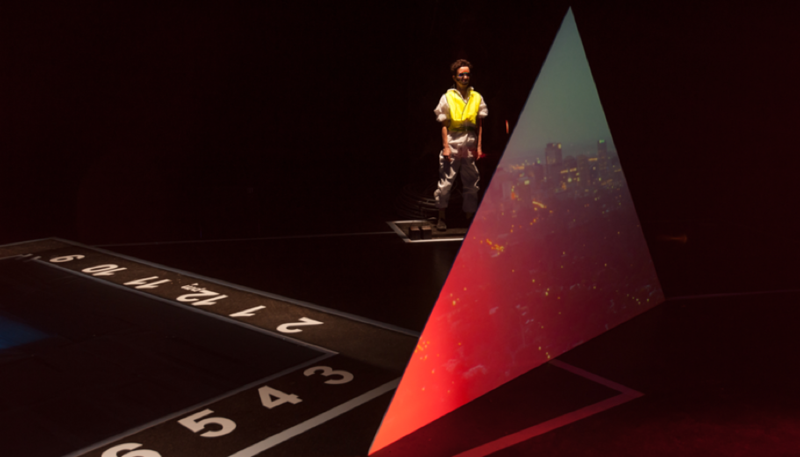 In the last performance of FAR-FLUNG, the choreography was decided algorithmically. Additionally, the program chose a random structure. When the piece was active, playable, ON, 1 – and when the space was passive, blocked, OFF, 0. As a result it decided how long each piece lasted. Can human time and machine time be interchanged? Can different time concepts coexist in the same piece, such as real-time, remote time, a randomly decided running time, as well as clock-ticks turned human time? 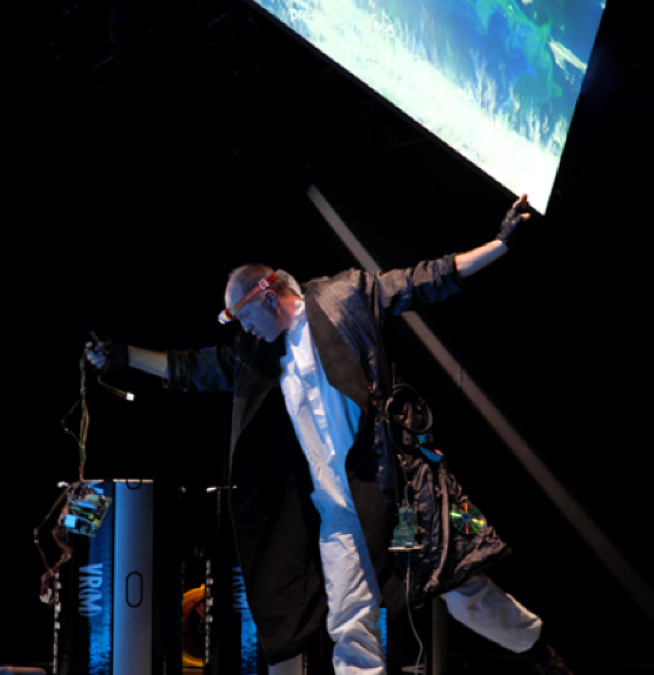 FAR-FLUNG’s (fx) form is also of collaborative nature, ultimately bringing together a wide range of participants to develop this performative enactment of the inner processes of computer networks. We’ve already begun with our first research scenario. I invited participants at the Radical Networks Conference to contribute ideas and drawings (!) to Module 1, Volume 1 by filling out printed versions of HTML Input Fields. Over the next few months, I’ll keep physically collecting ideas inspired by a variety of networked culture keywords, such as interactivity, randomness, or quantification. Since the mid 1990s the Internet has impacted Ursula Endlicher’s practice, where she focuses on the physical, structural, and metaphorical aspects of networks: She builds frameworks for Internet Art works and performances, but lets real-time data be the lead for their choreographies. She extracts rule sets from the Web and repurposes them for installations and objects. Her videos often feature characters depicting anthropomorphized code.